I have some bad news to share. It looks like my journey has been cut short, as I stuggle to type this sentence, with a broken collar bone. I am sure that I cannot carry a backpack for awhile and so I may have to head home. On this auspicious day, when at least a billion chinese worldwide are ushering in the year of the Rooster and at least that many Christians mark the start of Lent period with Ash Wednesday, I nearly lost my life. Here, more or less, is what happened. I am lying in a bed about to spend my first night ever in a small hospital. I am in the village of Naivasha, Kenya. The kind doctor has taken a cursory look at me and ordered that I be sedated and given painkillers and put to rest until the next morning when he can better assess and X-ray me, to see how broken up I am inside. He doesn’t yet know how to fix me. Beside me, dromogal, the toughest woman I know, keeps watch, looks very distressed, sighs and prays over me. At least she is not in the state of panic or on the verge of a breakdown, as she had been an hour ago. That means I am NOT going to die, right? I am more worried about where she is going to sleep that night and insists that she lie next to me. She refuses. We argue until I tire out and doze off myself…..I sleep a dreamless sleep. 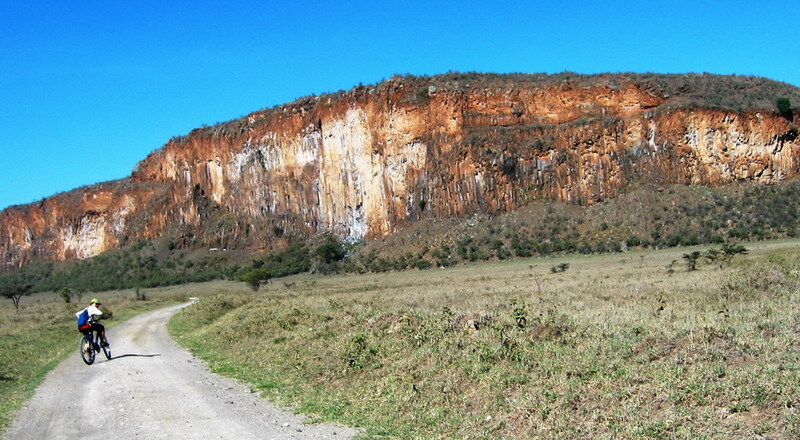 We were both on rented bikes, cycling through “Hell’s gate” — a national game park in Kenya, named for its appearance. The volcanic region has rock formations which looks like the fires of hell lining the park and towering rocks, like a collection of tortured souls, to go with the theme. We were on our way out of “hell”, after visiting a deep gorge with hot water flowing through it and a geothermal power plant somewhere near there. As we cycled the seven kilometre dirt road to make our way out, we were easily distracted (just as we were on the way in) by plenty of the most beautiful African game animals — zebras, giraffes, wild boars and gazelles and baboons — all roaming free in their colorful skins. They shied away and even fled when we gave chase. We felt like kids in a playground, with no other tourists around. We saw a herd of them run past earlier and they largely ignored us, so we didn’t think there was much to fear from this awesomely huge creatures. This one, though, was a menacing tonne. There it stood, staring at me as if suffering from myopia – The one wild buffalo. I was still at least 100 metres away approaching the buffalo. I cycled on, assuming that it too, like all other animals we have encountered so far, would flee as I approached. But as I cycled nearer, The buffalo did not move, but instead, stared at me curiously. So I stopped my bike and waited. The animal then turned away, to my relief. But a few seconds later, it turned back again and stood there, staring at me. And then, the worst thing happened. To my horror, it kneeled down on one foot and snorted, taking a posture that can only mean that it was about to charge. I threw my bike down, shouted an expletive and ran as fast as I could. What follows is a blur to me as my survival instincts took over, as the buffalo made me prime target. The animal attacked me relentlessly and charged at me as I tried to crawl away. I remember feeling like I was hit by a car and then rolled over under it. I had no defence against the beast as it kicked and head-butted me over and over again. Even dromogal could do nothing but yell. She cried for JESUS. BAM!” the animal hit me again for the third time. And then, I must have closed my eyes awhile, resigned to my fate, when I realized it was no longer after me. I glanced away and to my horror saw the buffalo now going for dromogal. Luckily, she dived and it ran over her and after that, ran away. Five minutes later : I sat there, blood streaming down my arm and from my head. “Jesus help. Jesus help.” Dromogal has gone into a panic. I am also in a state of shock. “Do I have a big hole in my head?” I asked, as my vision on my right eye starts to blur as I can feel a warm liquid covering it. I stare down to see blood stains on my torn shirt. My entire body is almost covered with dust. And there is a sharp pain coming from my right shoulder, which I cannot move. I start to panic too when I saw that dromogal had taken out almost entire roll of tissue paper and was pressing it on my head, presumably to stop the bleeding. “Jesus help. jesus help … PLEEEEEEZ” for no one else can at this point. 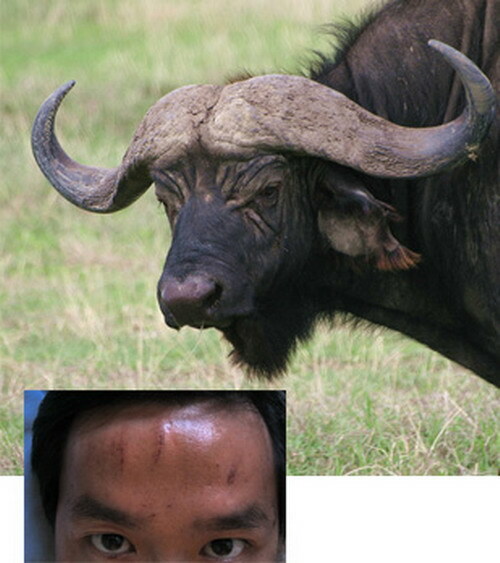 when I knew that I would live through a buffalo attack. Someone kept saying that I may have a dislocated shoulder, and it sure feels like it. I have been sent to the nearest hospital by a passing tourist with a jeep. The doctor is examining me — I feel a headache and my vision is blur but I don’t tell him that, because dromogal is near me and she has not stopped freaking out yet. Furthermore, my poor vision must be because I am without my spectacles, I thought. I am starting, strangely, to think of damage control, perhaps my own way of dealing with shock. “Tell the doctor I have no insurance and I don’t want to stay in the hospital tonight. I am okay, I just need to rest, ” I tell my wife. The doctor, of course, insist that I stay the night for observation. Leave me in peace. I am about to spend my first night in a hospital. I wake up and find a pair of eyes staring back at me. It’s my wife, she has her head beside my bed and I can tell immediately, she is worried. I go back to sleep and dream and wish I was back on the morning before the tragic venture into Hell’s gate. The morning was perfect. I had woken up to imagine that it would have the most wonderful day. Birds chirped merrily, I stepped out of my tent, shook off a morning chill and looked up to see tall trees and green grass all around my bright orange tent. What a magical sight, like a scene from an enchanted fairy tale. Then, the sun shone and I felt warm on that beautiful spot beside the Lake Naivasha, west of Nairobi Kenya. An hour later, we were ready to go for our first SAFARI in Africa and true to our fiercely independent ethos, we chose one that you can cycle or walk through — Hell’s Gate. That morning, I had to bargain with a few local Kenyan teens who wanted to rent their bikes to us for 600 shilings. It was a negotiation ploy that worked everytime. The teen quickly agreed to our compromise to pay them just 50 shilings more. 550 shilings for the bike, and away we went….